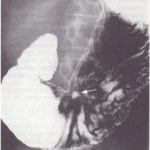 Menetrier’s disease is a rare condition in which there is thickening and enlargement of the gastric mucosal folds. Histologically there is hyperplasia of the mucin-producing cells with glandular proliferation and loss of the parietal and chief cells. 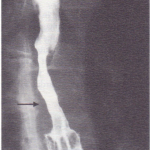 The patient may complain of epigastric pain and occasionally peripheral oedema may occur due to hypoalbuminaemia resulting from protein loss through the gastric mucosa. Symptomatic treatment is all that is required for this condition. It is possibly premalignant. The commonest benign tumour is a leiomyoma. This tumour is usually discovered by chance but it can occasionally ulcerate and produce haematemesis. Treatment is surgical removal. 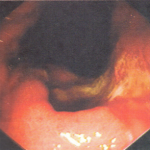 Gastric polyps are uncommon and are again found usually by chance. They produce no symptoms. The commonest are regenerative or hyperplastic polyps, which are often multiple and require no treatment. Rarely, adenomatous polyps are found and endoscopic removal is recommended because of possible malignant potential. Most gastric cancers appear not to arise from pre-existing adenomas (in contrast to colonic carcinomas). Carcinoma of the stomach is one of the commonest malignant turnours of the gastrointestinal tract and is the sixth most common fatal cancer in the UK. The frequency varies throughout the world, being high in Japan and Chile and relatively low in the USA. In the UK, 15 per 100000 males are affected per year. The worldwide incidence of gastric carcinoma appears to be falling, even in Japan, for no obvious reason. The incidence increases with age and more men than women are affected. 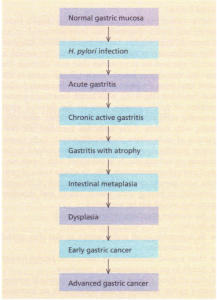 There is a strong link between H. pylori infection and gastric cancer. It is suggested that H. pylori infection results in chronic active gastritis which eventually leads to gastritis with atrophy and intestinal metaplasia-a premalignant pathological change. Much of the previous epidemiological data, i.e. the increase of cancer in lower socio-economic groups, can be explained by the intrafamilial spread of H. pylori. Dietary factors may still be important as both initiators and promoters may have separate roles in carcinogenesis. These include alcohol, spiced, salted or pickled foods and nitrate ingestion. Nitrates can be converted into nitrosamines by bacteria at neutral pH and nitrosamines are known to be carcinogenic in animals. Nitrosamines are also present in the stomach of patients with achlorhydria who have an increased cancer risk. Smoking is also associated with an increased incidence of stomach cancer. 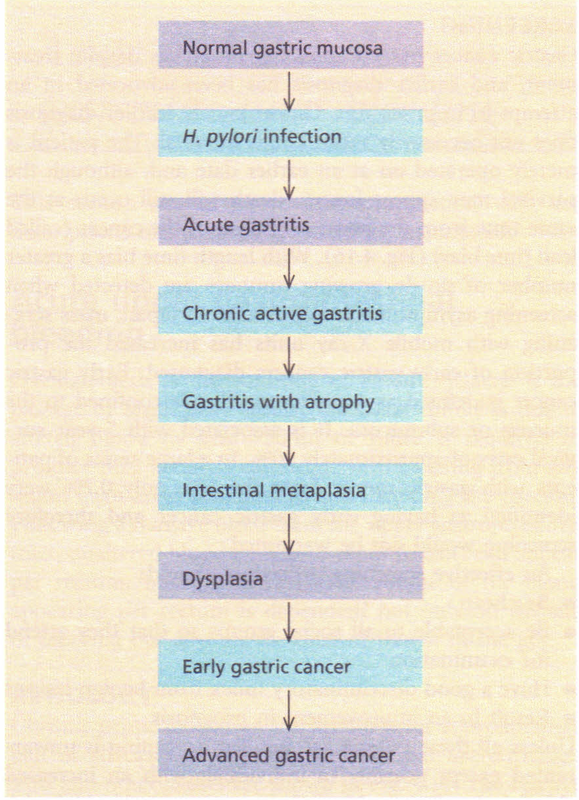 Flow diagram showing the development of gastric cancer associated with H. pylori infection. Genes underlying the inherited susceptibility to gastric cancer have not yet been identified, but certain patterns are emerging as seen in colonic cancer. There is a higher incidence of gastric cancer in blood group A patients. Possible precancerous conditions Benign gastric ulcers do not develop into gastric cancer. It can, however, be difficult to differentiate a benign ulcer from a malignant ulcer, as even malignant ulcers can partially heal on medical treatment. For these reasons it was originally thought that gastric ulcers could become malignant. Pernicious anaemia carries a small increased risk of developing gastric carcinoma. 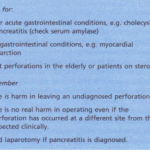 Gastritis with atrophy present in the body and fundus of the stomach of these patients may be a precancerous lesion. Gastritis with atrophy and also areas of intestinal metaplasia are areas where many gastric cancers develop. Intestinal metaplasia and chronic gastritis are also found in the resected stomach and there is an increased incidence of gastric cancer after partial gastrectomy (especially with a gastrojejunostomy). This increased incidence is the same whether the gastric resection was for a gastric or duodenal ulcer and may all be a reflection of H. pylori infection.